It’s the end of the month which means Loot Crates should be shipping. This months theme was “Heroes”, which is similar to last weeks theme “Villans”. I was pretty sure their would be some TMNT and Guardians of the Galaxy items since those movies were released recently. Overall I liked the contents of this months crate. This box reminds me of old TMNT play sets I used to own. I had all the turtles and I used to keep myself entertained for hours. This was a cool touch; Loot Crate is releasing more unique box designs. I can’t wait to see what future boxes will look like. With a cool sewer box you need some TMNT! Kid Robot is the manufacturer of this mini. I like the quality of Kid Robot products and this one did not disappoint. 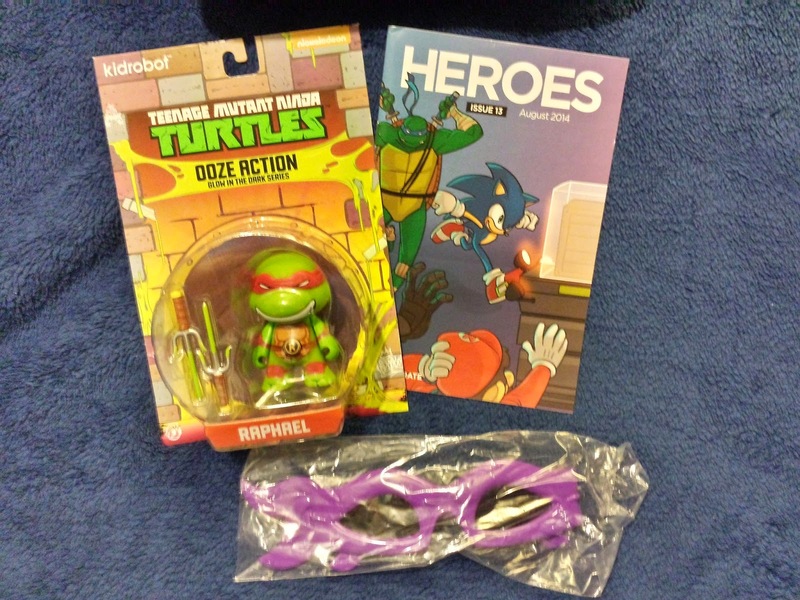 Raphael is not my favorite character but I’m happy. If anyone wants to trade for a Leonardo figure, let me know. The mask sunglasses were pretty cool too. I will probably not use them since they feel small on my face. I’ll probably give that to my little brother. The big item in this crate was the exclusive Funko vinyl of Groot. After watching Guardians of the Galaxy I became a fan. I didn’t read a lot of comic books when I was younger because they were too expensive but I may start reading this series. It seems like a interesting story. Other items include this months theme button, a magnet, a pair of sneaker wings, some codes for digital games and a mega man air freshener. That works out because i needed a new air freshener. I’m satisfied with the contents of this months crate. I thought it would have came with a t-shirt since Villans came with one. I’m starting to like the Funko vinyls and might start collecting more characters. I can’t wait to see what the great people over at Loot Crate have in store for next month. 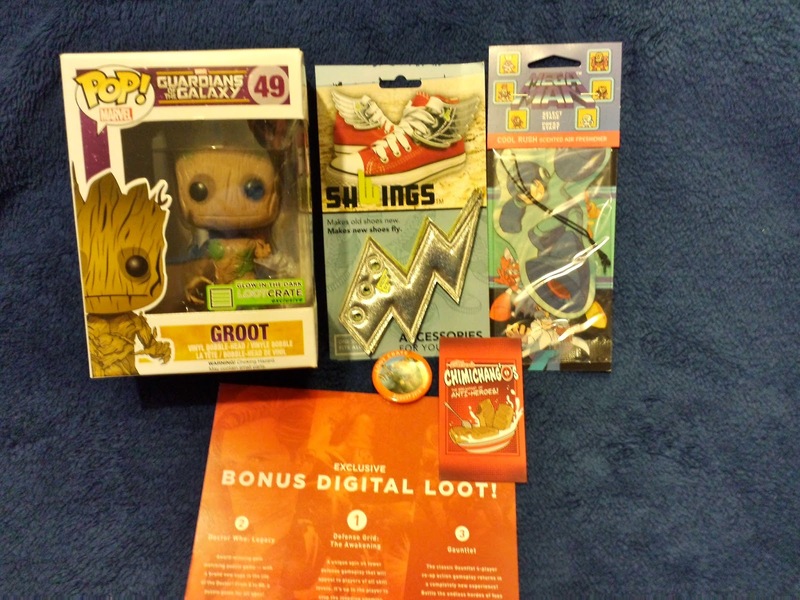 If you want to subscribe to Loot Crate, use this URL: http://mbsy.co/cQvM. If you sign up with that link, it adds to a free crate for me. If you have any more questions, feel free to comment below. Until next time, Train Hard, Game Hard.